One might argue that entertainment in the United States of America is a complicated construct that can be boiled down to two things: music and film. However, to actor and musician Jared Leto, American society worships six pillars of culture. These six focal points of every American thought, Tweet, and action are displayed in bold black text against a pink backdrop on Thirty Seconds to Mars’ new album, AMERICA. Five years since their last album LOVE LUST FAITH + DREAMS, Leto and his brother Shannon portray the general American psyche in six names: “Kim Justin Jesus Michael Mickey Donald.” Yet the theme which seems to run subliminally through every song on the album rests on the last name. USA Today asked Leto about his emotional inspiration for the newest project in which he responded, “Fear. Failure. Hope. Dreams. Love.” In the same conversation, Leto rightfully labels intolerance as the scariest portion of American conflict right now. Leto voices his anger and frustration with racial and political intolerance not only in the lyrics of each song, but also in the overall style of music. Single anthem “Walk on Water” is a passionate call for rebellion which fits the gospel, call-and-response format. Collaborations with A$AP Rocky on “One Track Mind,” Halsey on “Love Is Madness,” and Zedd drag Thirty Seconds to Mars further away from the stereotypical hardness of emo-rock into the modern world of electronica and pop. This underlying tone of hope and unity, according to Leto, is more necessary in America today than ever before. The band’s progression and new experimentation certainly stems from Jared Leto’s numerous influences. In an interview with Rolling Stone, Leto cited the synthesizers of Depeche Mode and The Who and the distorted guitar of Pink Floyd as major influences on the album’s electronic sound. However, he also mentioned Kanye West as “an inspiration for his bravery” and the bold minimalism of Father John Misty in his track “Bored in the U.S.A.” He even names the Thirty Seconds to Mars tour “Monolith” in tribute to Hans Zimmer and the brilliance of soundtracks. Also, Jared Leto managed to make this entire album while filming Suicide Squad and Blade Runner 2049. Sure, many argue Suicide Squad is a failure in every aspect of the word, but Jared Leto plays a creepily convincing Joker. More importantly, his portrayal of the creator Replicant Niander Wallace in Blade Runner 2049 is technically stunning. 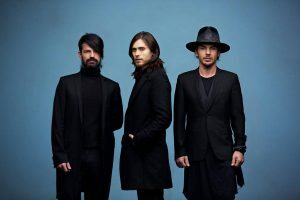 Thirty Seconds to Mars will be rolling through the Northeast on their “Monolith” tour this June. Tickets are available on Ticketmaster through the band’s website. Members of Thirty Seconds to Mars pose for a promotional photoshoot for their new album.